SOUTHERN UTAH– Several national parks in Southern Utah are raising fees in order to fund important maintenance and improvement projects within the parks, a National Parks release issued Thursday said. 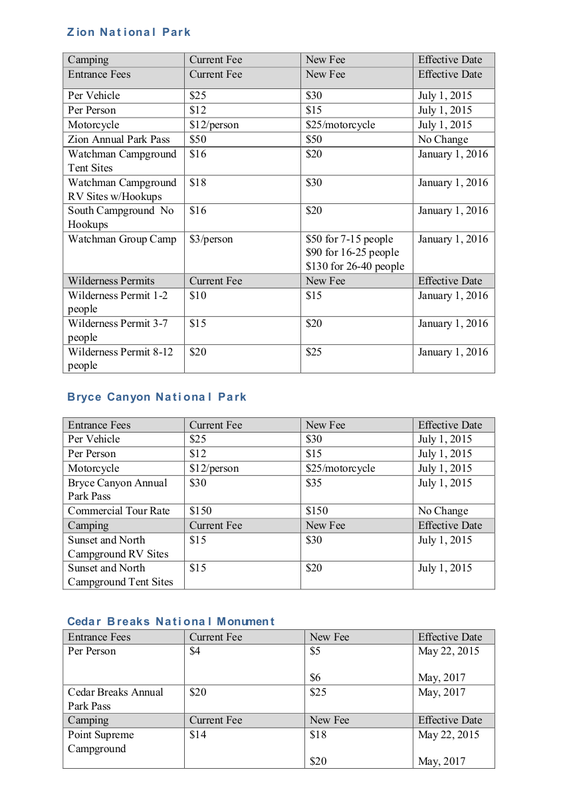 In 2014, the National Park Service issued the call for parks nationwide to conduct stakeholder outreach through civic engagement to gauge support for possible fee changes to entrance, expanded amenity and special recreation permit fees authorized by the Federal Lands Recreation Enhancement Act of 2004. Entrance fees had not been raised since 2007. Bryce Canyon and Zion national parks and Cedar Breaks National Monument started the discussion of raising fees in December 2014 by calling and visiting with state, federal and local legislative offices and staff. The three parks also issued press releases, posted proposed fee increase information on park websites and Facebooks and attended a variety of public meetings to gather feedback. Entrance fees are not charged to persons under 16 years of age or holders of the America the Beautiful National Parks, federal recreational annual, senior, access or military passes. These passes may be obtained at the park. The interagency passes, honored at all federally managed land units, are not affected by the entrance fee increase and will remain at $80 for the interagency annual pass, $10 for the senior pass, and free for the access or military passes. Learn more about the various passes available here. Looks like RV’s and Motorcycles get hit the hardest on the fees. Motorcycles more than doubled, RV camping just got an almost 70% bump up in cost too. That darn Obama! Dang libruls! Communists!